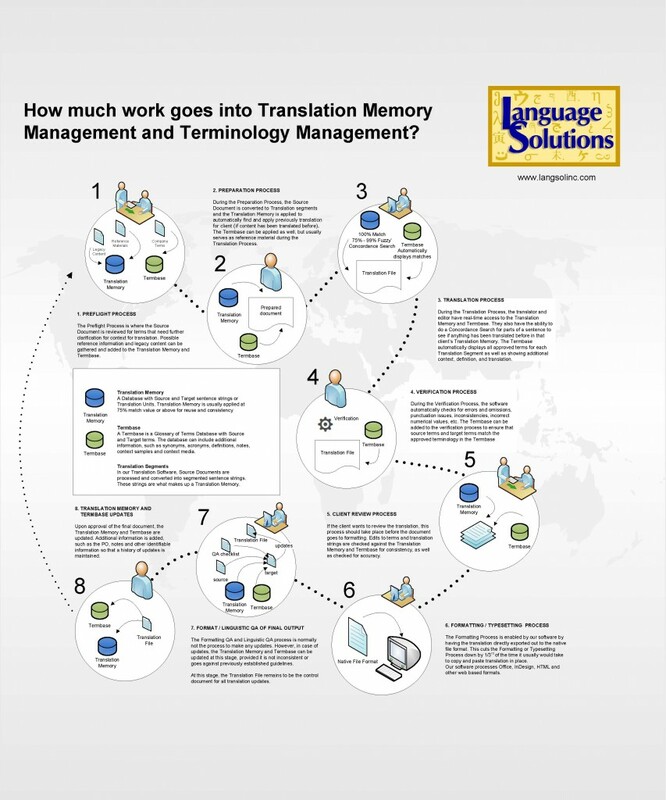 Translation Memory Management | Language Solutions, Inc. Consider Project Management as one of the key success factors in Translation Management. Each member of our team is dedicated to the success of your project. The Preflight Process is where the Source Document is reviewed for terms that need further clarification for context for translation. Possible reference information and legacy content can be gathered and added to the Translation Memory and Termbase. During the Preparation Process, the Source Document is converted to Translation segments and the Translation Memory is applied to automatically find and apply previously translation for client (if content has been translated before). The Termbase can be applied as well, but usually serves as reference material during the Translation Process. During the Translation Process, the translator and editor have real-time access to the Translation Memory and Termbase. They also have the ability to do a Concordance Search for parts of a sentence to see if anything has been translated before in that client’s Translation Memory. The Termbase automatically displays all approved terms for each Translation Segment as well as showing additional context, definition, and translation. If the client wants to review the translation, this process should take place before the document goes to formatting. Edits to terms and translation strings are checked against the Translation Memory and Termbase for consistency, as well as checked for accuracy. The Multilingual Typesetting Process of the translation is enabled by our software by having the translation directly exported out to the native file format. This cuts the Formatting or Typesetting Process down by 1/3rd of the time it usually would take to copy and paste translation in place.Our software processes Office, InDesign, HTML and other web based formats. The Formatting QA (print and screen proof) and Linguistic QA (translator proof) process is normally not the process to make any updates. However, in case of updates, the Translation Memory and Termbase can be updated at this stage, provided it is not inconsistent or goes against previously established guidelines. At this stage, the Translation File remains to be the control document for all translation updates. Upon approval of the final document, the Translation Memory and Termbase are updated. Additional information is added, such as the PO, notes and other identifiable information so that a history of updates is maintained.